The other reason is that, unlike Star Wars, Star Trek’s timeline is rather skeletal. Chronologically, you have Star Trek: Enterprise, followed by the original series, followed by the original films I-VI, followed by The Next Generation. Then they’re all capped off with Star Trek: Voyager – or they were, last I checked. So while there’s a lot of room for stuff to happen in between these different stories, since no one has bothered to define the cut off limits or to explain how many years have elapsed, authors who are Star Trek fans just shoot darts at the timeline trying to hit it. L. A. Graf generally sticks the landing, as mentioned in this review here, but others tend to throw wide of the mark. Jean Lorrah is one of these authors. While she is clearly a passionate Trek fan who greatly admires the Vulcans, her grasp of the timeline appears to be a bit… vague. At the very least, she didn’t give readers much of a hint as to when her story was set; all I can say for sure is that it takes place before we see Doctor M’Benga aboard the Enterprise. Her writing style also left something to be desired. Don’t get me wrong – she doesn’t write badly. But she could definitely have been clearer in her descriptions. Okay, now we can discuss the story. The Vulcan Academy Murders starts out with the Enterprise battling a Klingon warship, which does not survive the fight. But before it is destroyed, it does inflict some serious damage on Kirk’s vessel, specifically the Auxiliary Control for the photon torpedoes. The two officers on duty there – Pavel Chekov and Carl Remington – manage to fire the kill shots before succumbing to a gas leak caused by a lucky hit from the Klingons. Chekov is fortunate in that he comes through the battle ill but intact. Remington, on the other hand, is in serious trouble. Though McCoy manages to save his life, the boy’s voluntary nervous system is completely paralyzed. He can’t move – not even to open his eyes. McCoy fears that, even if Remington pulls through this initial battle, he may remain paralyzed and in bed for the rest of his life. With no other way to confirm his mental health, Spock performs a mindmeld to see if Remington is still self-aware. Confirming that the boy is indeed conscious and able to reason, he explains that there might be a viable treatment which will save Remington’s life and sanity. Spock’s own mother is undergoing the same experimental cure on Vulcan; as it turns out, she was suffering from a degenerative disease that occurs in humans when they have lived in alien environments for long periods of time. Once there, they learn that a Vulcan woman is undergoing the same treatment after an regrettable accident with some machinery. Leaving all three patients in their force-field encapsulated regenerative tanks, Spock, Kirk, McCoy, Sarek, and the two doctors in charge of the project go out to dinner. One of these doctors is the human who invented the cure, Dr. Daniel Corrigan. The other is his Vulcan partner and friend, Sorel. Dinner is a fine affair, but just as they’re about to pay the bill and head home, Sorel stiffens and clutches his chest. He can sense that his wife, T’Zan, is in danger of death. 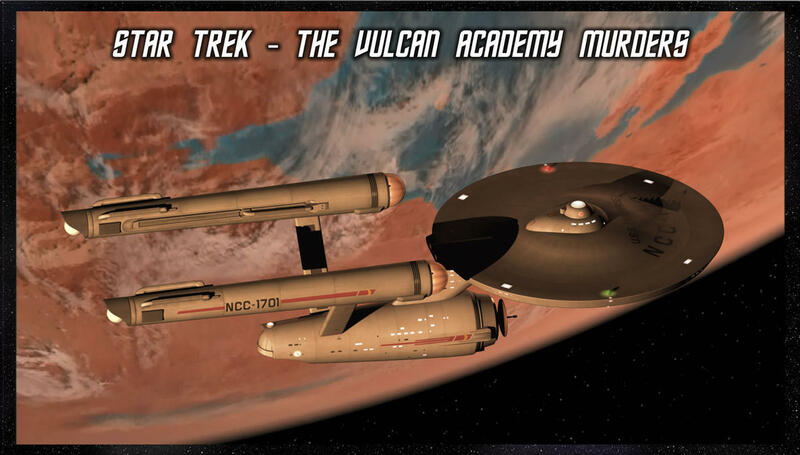 Rushing back to the Vulcan Academy, despite their best efforts the guys are not able to save Sorel’s wife. She dies in the medical room. Though Corrigan immediately blames himself for this, Kirk openly suspects foul play. Over the next few days, he begins investigating the matter, believing that someone wants to sabotage the cure. When Remington dies as well and a fire is set in the Academy, Kirk’s suspicion that a murderer is loose becomes the only logical explaination for the cascading disasters…. 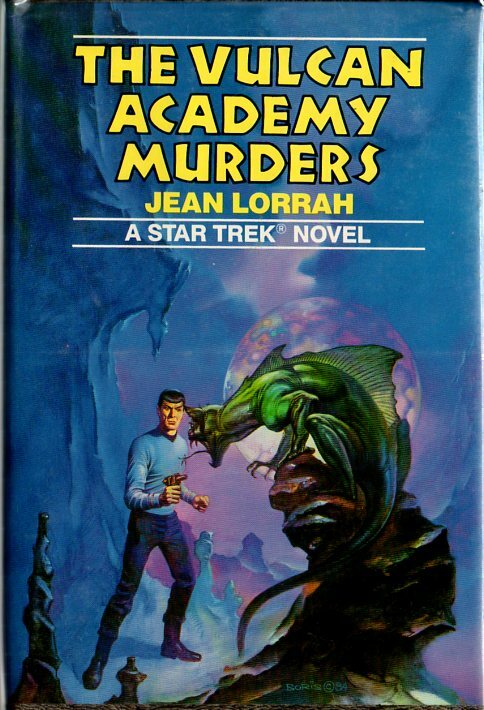 While I liked The Vulcan Academy Murders, as I said above, I did have a few problems with it. The writing style isn’t my favorite, and though it became tolerable after awhile, it still grated on my nerves from time to time. I must say that the method by which the author described Vulcan telepathy and how they form romantic, psychic connections was done well. It was entirely plausible and believable. But I really didn’t like the way she handled Kirk. In some scenes he was fine, but in others Lorrah seemed to be actively dumbing him down. That was annoying; I like Kirk. He’s the best of Star Trek’s captains, and anyone who disrespects him in a major way (such as by poor writing) gets on my bad side. So long as he is portrayed well by an actor or a writer, I’m happy. But if the writers make him less than he is, as Lorrah did on a couple of occasions here, that leads me to give the book an automatic demerit. Despite these objections, The Vulcan Academy Murders is a good story. If ST fiction isn’t your thing, or if my minor problems with this tale have convinced you that you would not enjoy the story, then you will probably want to avoid the book. But if you like Star Trek, a good mystery, and want to see Kirk look somewhat stupid, then this book might appeal to you. This entry was posted in Book Reviews, TV Shows and tagged Amanda, Book Reviews, Captain James T. Kirk, Captain Kirk, Dr. McCoy, Ensign Pavel Chekov, Jean Lorrah, Klingons, L. A. Graf, murder mysteries, Sarek, Spock, Star Trek, Star Trek novels, Star Trek: Enterprise, Star Trek: Voyager, The Next Generation, The Vulcan Academy Murders, TV Shows, Vulcans on September 7, 2018 by The Mithril Guardian. 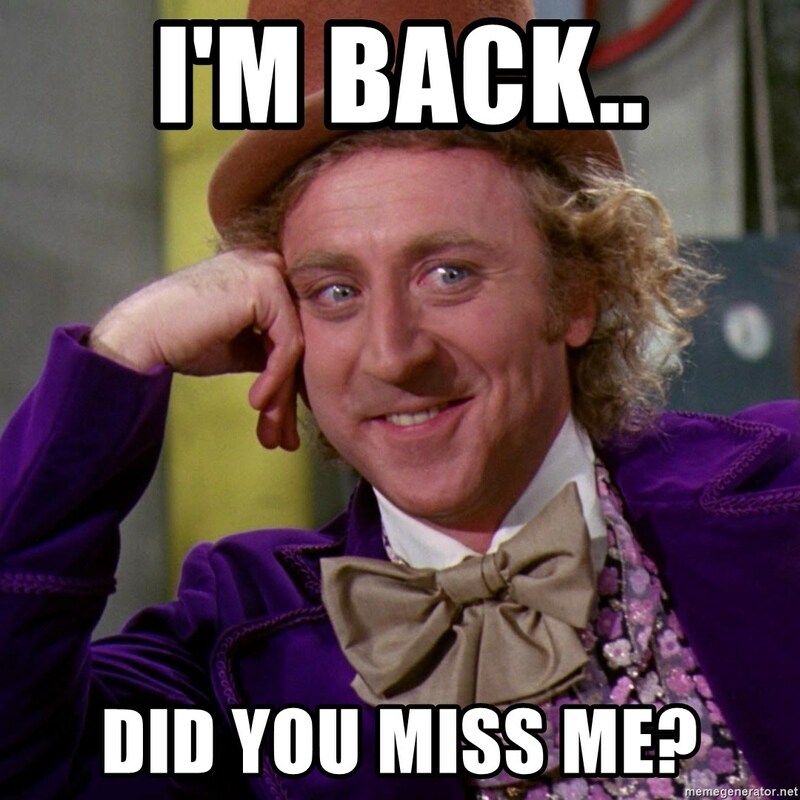 Well, readers, here we go again! In this post are some more introductory themes and songs from my favorite TV shows! This entry was posted in Music Reviews, TV Shows and tagged Andrew, Bob Crane, Caskett, Castle, Della Reese, Early Edition, Fisher Stevens, Gene Roddenberry, Hogan's Heroes, Jeri Ryan, John Dye, Kate Beckett, Kate Mulgrew, Kit, Knight Rider, Lief Erickson, Magnum P.I., Monica, muder mysteries, Music Reviews, mystery show, Nathan Fillion, Nikki Heat, Rick Castle, Robert Beltran, Roma Downey, Star Trek, Star Trek: Voyager, Tess, The Greatest American Hero, The High Chaparral, Tom Selleck, Touched By An Angel, TV Shows, TV Theme Songs, TV Themes, Western TV Shows, westerns on February 19, 2016 by The Mithril Guardian.